Enough functionality to fight YouView et al? Review Television's a lot smarter than it used to be, and there's an ever-increasing number of ways that the basic experience can be enhanced, whether it's by providing extra Over-The-Top (OTT) content with services such as Netflix, or convenient features, such as the ability to set recordings when you're out and about, using text messages or a smartphone app. More and more of us are using digital recorders of some sort, allowing pause, rewind, ad skipping and series links. Meanwhile, providers are bundling more services, encouraging us to take telephone, TV and broadband from them as a package deal. Sky has its box, Virgin offers you Tivo, while BT and TalkTalk have their own versions of the YouView box. There are plenty of other Freeview recorders around too. 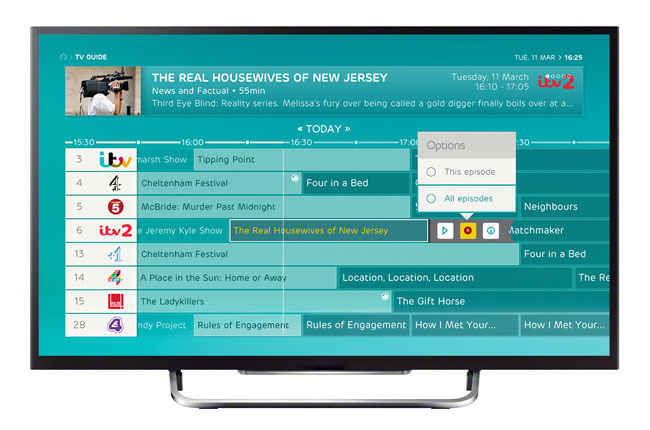 It's into this arena that EE has stepped, with its new Netgem-built EE TV box. And, frankly, it’s a bit of a curious proposition, when compared with the offerings from some of the other firms. The box is free, as long as you have EE broadband, and a mobile phone from EE or one of its constituent networks - including PAYG, but not business accounts. You'll have to sign up to an 18-month contract, at a tenner a month, plus line rental, for a total of £25.74. The box belongs to EE, and has to be returned if you cancel the service. So, what do you get for your money? It's a pretty compact unit, a square around eight inches per side, and two inches tall. The top has a perforated grille, through which you can see the innards, while the front sports just a large LED - red while in standby, and green when running. Around the back are ports for Ethernet, HDMI, SPDIF, analogue audio, and a custom port into which a SCART adaptor can be plugged, if necessary. The power supply is a wall wart. What's inside is perhaps more intriguing. We're used to two tuners, allowing a recorder to do that usual watch one, record another or - with suitable software - record two and watch a third when the muxes are in alignment. 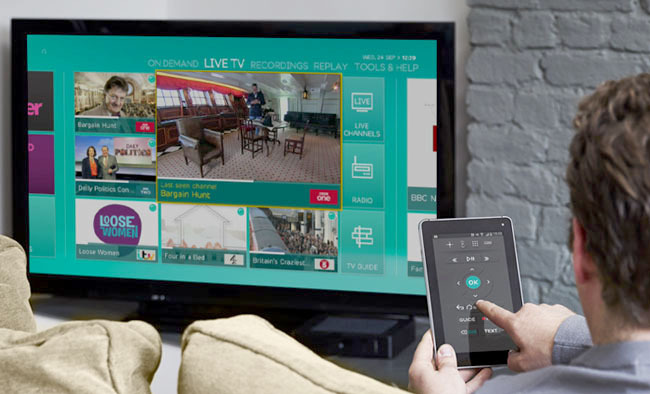 The EE TV has four tuners instead, and you can dedicate two of those to a system called Replay, of which more later. The hard disk is a generous 1TB. You can only get the box with an EE broadband contract, and it will only work with their service. It also calls home, so they know when it's been activated, so it's unlikely you'll be able to, say, take out a contract and give the box to your mum.